Home > Zoom in>Lifestyle> Yuka said ! The app that helps you translate what you consume! For a better to buy your products and to adopt a healthy and responsible consumption, discover the composition and the notes of the care Akane screened by the application Yuka. It can never be repeated enough, we have a single skin, an envelope that protects the body shocks and external aggression. Because it's unique, you have to take care of it. After the glorious years of overconsumption in the food, cosmetic and textile industry, more and more people are rethinking how they consume on a daily basis. At Akane, we lent ourselves to the game of transparency to reassure you about the composition of our products. 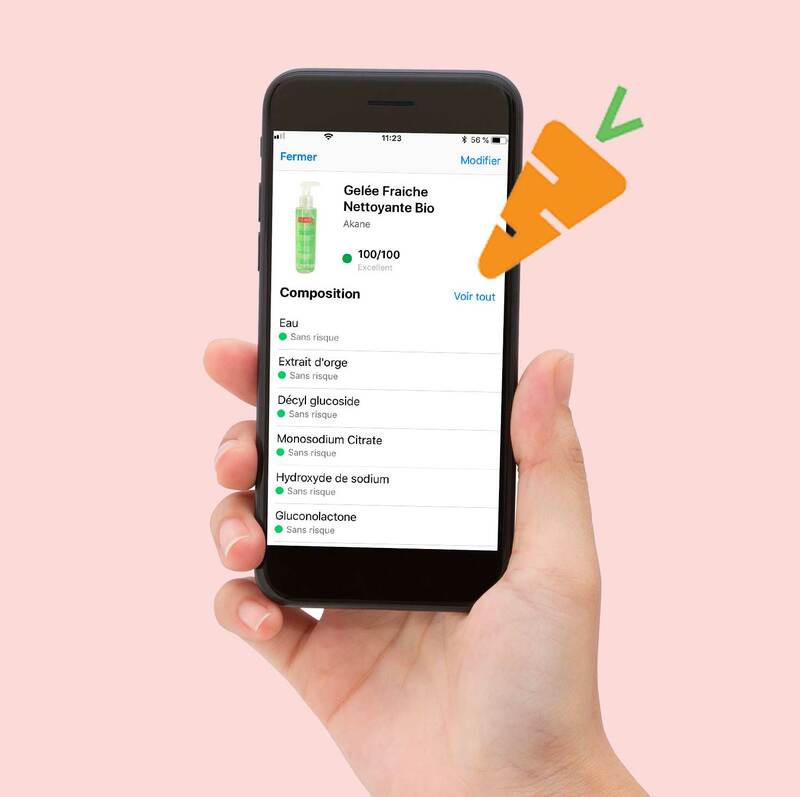 We have scanned all our products through the Yuka application (as well as Clean Beauty and Quel cosmetic), to highlight the quality of our products and help you make your choice. We want to share with you the results obtained on the Yuka application. Our commitment to healthy, active and natural cosmetics is important to us. Result: All the references of the range obtain the mention "excellent" with an average mark of 93,8 / 100 and many products which obtain the note of 100/100! For the sake of transparency we have identified the ingredients that appeared in yellow considered "low risk" by the application. Citronellol: This ingredient is obtained by the distillation of geranium and lemongrass essences and it is also present in the rose. It can be considered a low allergenic. The risk of allergy is still very small. Products concerned: Organic Flower and Fruit Water formulated with floral water of organic Damask rose. Benzyl Alcohol: This ingredient is used as a preservative. In some cases very rare it can be slightly irritating. Utility: allows you to have a color stability of a formula over time. Products concerned: BIO Organic Moisturizing Cream, Organic Anti-Wrinkle Silky Cream, Organic White Bleed Mask, Organic Pink Granite Mask, Organic Nocturnal Coconut Mask. Usefulness: provides a good coverage of our BB Family care. Products concerned: Rosy Dewy Organic Lip & Cheek Cream, Tinted Velvet BB Eye contour, Tinted Velvet BB Organic Cream, Rosy Dewy organic Cream. Little by little, we favor short circuits, products from organic farming and local producers. We are witnessing a real return to the sources. The costumer becomes a consumer and want transparency about the ingredients of the products he buys. In cosmetics, the use of controversial ingredients makes talking. 46%* of cosmetic products contain harmful or suspected harmful components for the skin and the environment. But how do you know if the composition of the product is healthy and which company we can trust? Many labels and certification bodies exist to guide the consumer in his choices. Cosmebio and Ecocert are good references thanks to precise specifications aimed at offering products that are holy and respectful of the environment. Their mission according to the various charters is to guarantee the absence of pesticides in the products, a superior quality of the raw materials resulting from the organic farming, a percentage of ingredients of natural origin always superior to 95% and an irreproachable traceability . If you want to enter the details, deciphering a list of ingredients takes time and is not easy for everyone. Yet controversial ingredients, suspected of being endocrine disruptors, carcinogens, or harmful to the environment are hiding under scientific names that must be decoded. But who are they and why are they risky? Many applications are emerging to help people in your daily shopping (cosmetic, textile or food) such as Yuka, What cosmetic or Clean Beauty. Their missions? Decode the ingredient lists on the back of your products to highlight the ingredients at risk and recommend the product or not. In most cases just scan the barcode of your product. For any additional questions about the ingredients of our products contact our customer service at the following address: service-client@akane-skincare.com we will be happy to answer you!